This section covers the steps required to install guests with PXE. 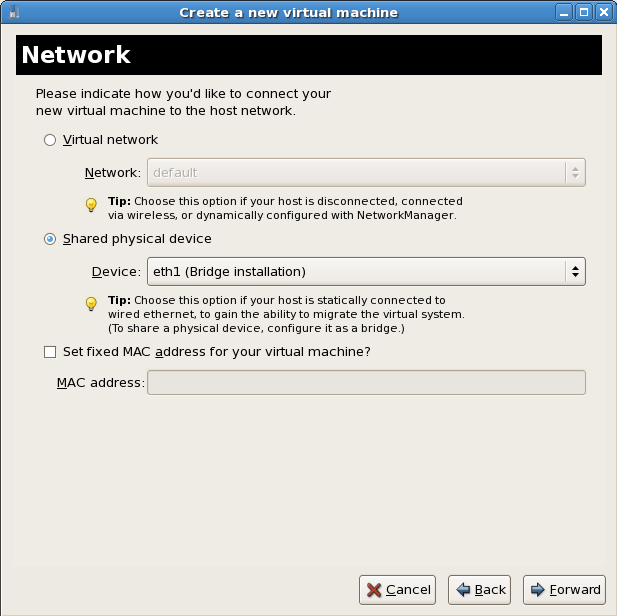 PXE guest installation requires a shared network device, also known as a network bridge. The procedures below covers creating a bridge and the steps required to utilize the bridge for PXE installation. Create a new network script file in the /etc/sysconfig/network-scripts/ directory. 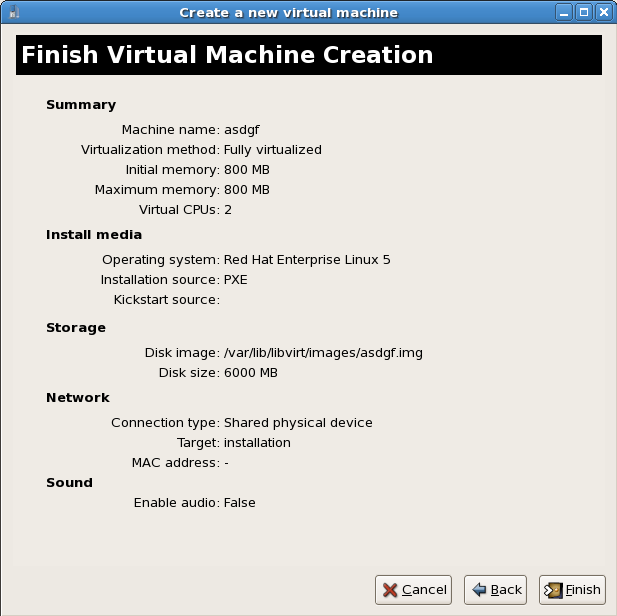 This example creates a file named ifcfg-installation which makes a bridge named installation. The line, TYPE=Bridge, is case-sensitive. It must have uppercase 'B' and lower case 'ridge'. Prior to the release of Red Hat Enterprise Linux 5.9, a segmentation fault can occur when the bridge name contains only uppercase characters. Please upgrade to 5.9 or newer if uppercase names are required. Start the new bridge by restarting the network service. The ifup installation command can start the individual bridge but it is safer to test the entire network restarts properly. There are no interfaces added to the new bridge yet. Use the brctl show command to view details about network bridges on the system. The virbr0 bridge is the default bridge used by libvirt for Network Address Translation (NAT) on the default Ethernet device. Edit the configuration file for the interface. Add the BRIDGE parameter to the configuration file with the name of the bridge created in the previous steps. After editing the configuration file, restart networking or reboot. Configure iptables to allow all traffic to be forwarded across the bridge. Reload the kernel parameters configured with sysctl. The bridge is configured, you can now begin an installation. For virt-install append the --network=bridge:installation installation parameter where installation is the name of your bridge. For PXE installations use the --pxe parameter. The steps below are the steps that vary from the standard virt-manager installation procedures. 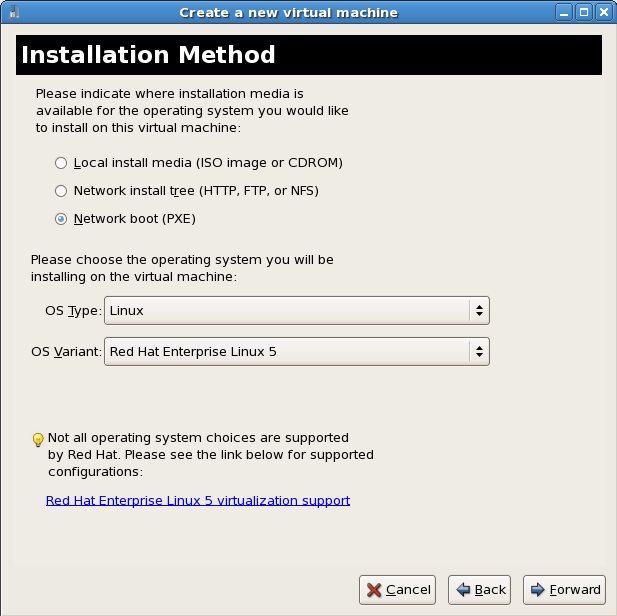 For the standard installations rsee Chapter 8, Guest operating system installation procedures. Select PXE as the installation method. Select Shared physical device and select the bridge created in the previous procedure. The installation is ready to start. A DHCP request is sent and if a valid PXE server is found the guest installation processes will start.